Spitfire. 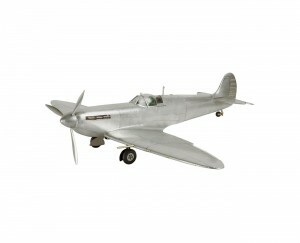 The legendary Spitfire fighter plane was introduced in 1936. The short-range, high-performance, single-seat aircraft gained notoriety in defense against Luftwaffe attacks during the Battle of Britain in 1940. As a mainstay of the Royal Air Force Fighter Command its speed and maneuverability were essential to carrying out its missions across the European and South-East Asian WWII theaters. The Spitfire was beloved by pilots, and in its many variants it served as trainer, interceptor, fighter-bomber and carrier-based fighter during the 1939-45 conflict. Its iconic status amoung enthusiasts has held strong in the ensuing years since its retirement from active service in the 1950s.